Geoff is the Head of Mobile Learning at Qualcomm, where he and his team use emerging mobile technologies to explore, innovate and champion how they should be used to enhance learning, and working. He uses these tools to support, and enhance the working lives of all Qualcomm employees, as well as sharing successes with the wider mobile learning community. 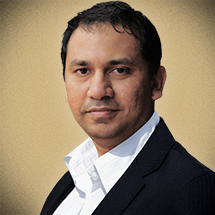 One of the earliest developers of Mobile Learning, he has been creating innovative mobile tools and techniques with educators across the globe since 2001. Learnnovators: We understand that one of your key mandates while joining Qualcomm was to encourage adoption of mobile learning across the enterprise. What are some of the interesting stuff that you do at Qualcomm to achieve this objective?Geoff: Qualcomm is huge – we have 30,000 staff, spread out all over the globe. Our employees already have many resources, and some great content available to them. To make mobile useful, it needs to be even better, and even more immediate than what they already use. The key is - we don’t mandate anything – people only use tools that they want to.Because of this, our focus has been on creating an ecosystem for mobile. Not just mobile apps and content. We developed an internal app store, to be one single catalogue of all mobile friendly sites and apps across our business. We also worked with vendors to license and list their apps for all our staff. This has been a huge success for us, and has unified several different mobile-friendly initiatives across our business.We’ve also moved beyond the traditional definition of learning. We build any apps that help our people work smarter, feel empowered, and enjoy working at Qualcomm. We want to make it easier to work, and learn mobile. We’ve been sharing some of our successes on WorkLearnMobile.org, so if you want to learn more, go check it out. Learnnovators: We see a lot of promise in capabilities such as Mobile Augmented Reality, Near Field Communication (NFC), and QR Codes holding for ‘contextual mobile learning’. What are your thoughts?Geoff: Mobile Learning can offer 2 very different things:1) mobile, and flexible access to learning you were doing before: (like e-learning, looking up information, phone calls, etc. )2) new ways to learn, very often connected with your context. The ability to find out critical information at the precise moment of needThe new ways to learn start getting really exciting when you add contextual information. Where is the learner? What are they doing? What do they need information about? This bringing together of Real and Digital is really empowering, but needs some form of connector to join the two together. The technologies you mentioned are all ways to do that (NFC / AR / QR-Codes / iBeacons / Image Reco / GPS, etc, etc.). I am excited by them all, not for the technologies themselves, but for learning possibilities they offer us! Learnnovators: How will smart phone capabilities such as Geo-location and Geo-fencing evolve further to power up Predictive Personalization? How do you think learning will benefit from this feature?Geoff: This is another example of connecting Real world to Virtual. Geo-fencing lets you define a physical area (using GPS, or similar) that can act as a trigger on your phone, when you enter that zone. Qualcomm develops an open source toolkit called Gimbal that lets you extend these to inside a building too. To test this out in a meaningful activity, we used Gimbal to create a mobile tour guide, adding contextually relevant information into our Qualcomm Museum. We placed small Bluetooth LE beacons (similar to iBeacon) around the museum, and developed an app that allows visitors to get extra information on their phones as they walk around the exhibits. The response has been awesome and we are now talking to several public museums who want the same thing. This may feel futuristic, but the cool thing is that the technologies are all already there (and cheap!) See http://www.worklearnmobile.org/articles/mobile-museum-tours-apps-and-indoor-positioning/ for more details. Learnnovators: As we know, m-learning is not e-learning on a mobile device. Learning designers who have been masters in designing e-learning interventions for years are facing a major challenge with transitioning to mobile. Where do you think today’s learning designers stand with respect to their skills in designing ubiquitous learning experiences? What would be your advice to help them to detach from the traditional mindset and relearn new strategies? Geoff: I’d say “Break it up!” and “Give up some control”. Break up longer courses into shorter interventions, and recognize that you need to hand over navigational control to the learner. One of the skills in creating e-learning courses was the story-telling dimension. This changes with mobile. You can no longer control the narrative in the same way. Learners have less time, and may want to jump straight to chapter 3. This needs to be supported, and woven into the narrative.There still is a space for mobile versions of e-learning, but it is dying out fast, as mobile learners discover more effective ways to find out what they need to learn. Learnnovators: We are amazed at the possibilities of looking at ‘downloading information’ into the brain as the future of learning (Refer the new research about ‘Automated Learning’ by Brown University neuroscientist Takeo Watanabe). What are your thoughts on this?Geoff: This is the Matrix, right? The idea that a computer could “pre-load” the learning of skills into our minds? I’m extremely skeptical about this – and in fact much of the hype misquotes what Mr. Watanabe’s paper was really saying. Any teacher will tell you that learners need to actively engage, to learn. There is no magic pill. The danger in getting excited by hype like this is that it can lead you down similar paths that waylaid early e-learning enthusiasts. Remember the obsession with the “automation” of the learning process? The mistaken idea that a machine that could replace the teacher, and do it all? What really happened was the automation of a content delivery process (pushing content onto a screen, and training students to click the right buttons). Not the learning at all. We risk making the same mistakes again.I’m afraid I’m a non-believer of learning by a magic pill. Instead, I want to help the learner to be as enthusiastic, and excited about the process of learning as possible. Mobile – done right – is great for that. Learnnovators: Before joining Qualcomm, you were the founder and leader of Tribal’s Innovation Team. You have always been passionate about technological innovations and greatly committed to learner empowerment. What are some of the wonderful stuff that you’ve done in the mobile learning space?Geoff: I’m proud of lots of stuff. I like that we built one of the first commercial learning apps ever (pre-app store, and pre-smartphone). Over 20,000 learners downloaded our driving theory test on “featurephones”. I like that we built a mobile blogging and picture sharing site for students before either of these concepts existed. I loved being able to do mobile learning in Africa before anyone believed it was possible. I loved taking mobile learning into youth prisons, and working with excluded learners. But this is going back in time – these things are pretty mainstream now.More recently, I worked with the US Government to build tools to mobilize hundreds of hours of compulsory e-learning content, including setting up the open standard they now use for mobile content sharing. I like that this has touched thousands of people’s learning. We also built a multi-national app to support info sharing after natural disasters. Medical responders getting rapid access to the latest information, even when remote, with patchy connectivity. I like the real, tangible impact this can make.Now I’m at Qualcomm, I have the additional privilege of trying out the most cutting edge, emerging technologies to see how they can help learners, and learning. I love being able to shape, today, some of the technologies we will all be using in 2-4 years’ time. Learnnovators: That sounds exciting! So is there a common theme, or idea that unites all your work in mobile? What comes next?Geoff: I guess my biggest joy is in using emerging technology to reach new learners, and address learning needs that are not currently being met. Whether it is a busy employee who needs smoother access to information or an excluded kid in a low-tech school. It is so often the case that technology invented for one purpose, can be repurposed for learning. My aim is to hunt out all the best ones, and encourage smarter adoption.Mobile is full of exciting technologies, and approaches that can help us transform how we teach, work and learn. We just need more passionate educators to think bigger, and fit them into our learning. You can follow our journey, and contribute thoughts on http://www.worklearnmobile.orgLearnnovators: Thank you so much for sharing your valuable insights and experiences, Geoff. It was wonderful interacting with you. We wish you and your team at Qualcomm the very best! 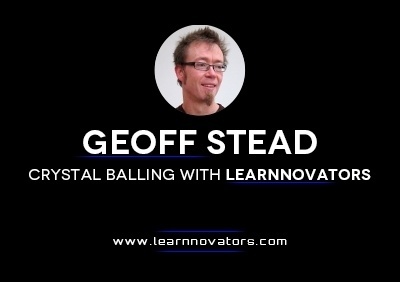 "Crystal Balling with Learnnovators" is a thought-provoking interview series that attempts to gaze into the future of e-learning. It comprises stimulating discussions with industry experts and product evangelists on emerging trends in the learning landscape.